is an award winning, compassionate & professional service that provides vacation & out of town pet care. is provided by our specialized team of pet sitters includes 2 Certified Veterinary Assistants & a Veterinary Technician. We specialize in areas of pet sitting that include pets with behavioral problems, medical needs, and senior pets. Shannon’s Pet Sitting is the TOP RATED Pet Care service on Angie’s List! We are the ONLY service providing Pet Sitting in Palatine, IL that has won the Angie’s List Super Service award. The award honors excellence among service providers who maintain a superior service record. Each year, less than 5% of thousands of businesses earn the award. Shannon’s Pet Sitting has won this award 3 times!! We are easily able to handle most medical conditions and assist owners with medicating pets if necessary. We provide pilling, injections, and subcutaneous fluids. We have a lot of knowledge, and hands on experience in treatment of Chronic Renal Failure and Diabetes in pets. 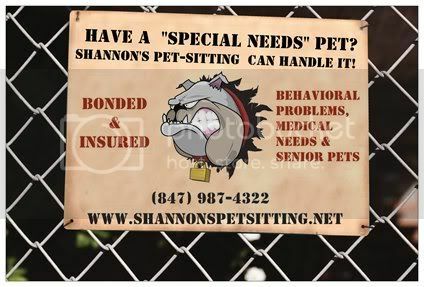 Shannon’s Pet Sitting is fully licensed professional business – not a hobby. Our business is registered, licensed, bonded and insured with the state, county & village. Our insurance policy from Pet Sitters Associates, L.L.C. provides exemplary coverage.